Whenever a miscarriage of justice hits the headlines, it is tempting to dismiss it as an anomaly – a minor hiccup in an otherwise healthy judicial system. Yet the cases of injustice that feature in this book reveal that they are not just minor hiccups, but symptoms of a chronic illness plaguing the British legal system. Massive underfunding, catastrophic failures in policing and shoddy legal representation have all contributed to a deepening crisis – one that the watchdog set up for the very purpose of investigating miscarriages of justice has done precious little to remedy. Indeed, little has changed since the ‘bad old days’ of the Guildford Four and Birmingham Six. Award winning journalist Jon Robins lifts the lid on Britain’s legal scandals and exposes the disturbing complacency that has led to many innocent people being deemed guilty, either in the eyes of the law or in the court of public opinion. An important account of real problems in criminal procedure that have been swept aside for decades. […] Jon Robins has skillfully interwoven case histories into the modern narrative of problems that exist within the criminal justice system. The strength of Robins’s feeling for the subject of miscarriages of justice is clear from the lively and engaging way that this book has been written. Compelling. A bleak and often Dystopian picture of British justice... . It's difficult not to be perturbed when seeing just how badly the justice system is failing. 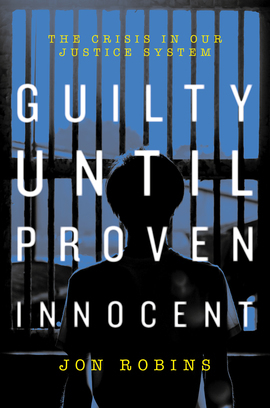 Best books for summer: Jon Robins reminds us of the wrong side of humanity in Guilty Until Proven Innocent, cataloguing the wrongs that lead to miscarriages of justice, compounded by the “extreme reluctance” of the courts to correct the original error. It is hard to choose the most compelling example, given the depth of research, but the range of cases show that fundamental failures in the criminal justice system are far too common for comfort. The Secret Barrister’s choice: Guilty Until Proven Innocent by Jon Robins is a no-holds-barred insight into the serious and often overlooked miscarriages of justice that stalk our broken criminal justice system. Journalist and campaigner Robins shines a light on the problems within criminal justice, and incisively exposes how easily and cheaply our founding principles of justice are cast aside. The criminal justice system is under unprecedented pressure: police numbers are being slashed, our courts are creaking and legal aid rates for defence lawyers have been frozen for years. It is against this alarming backdrop that we urgently need to talk about the reality of miscarriages of justice. Jon Robins has written a powerful and timely critique of a system in the grips of crisis.